We’ve been going to Dr. Douglas and her amazing team for years! They are so friendly, professional and sincere when caring for our dog. 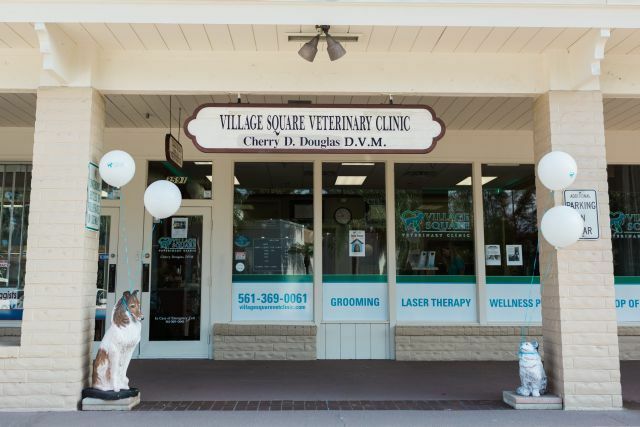 We couldn’t be happier with the Village Square Veterinarian team and we highly recommend them! Best bet office I’ve been to in a long time. No assembly line appointments. Doctor takes time to talk to you about your pet. Let’s you ask questions and gives back clear concise answers. Wonderful staff. Highly recommended! And Caeser loves going there!! Best veterinary clinic I have ever experienced and worked with in 16 years. The staff is genuinely and truly professional and compassionate about what they do. Village Square is amazing! The doctors and the staff all kind and loving with all they do with you and your babies. If you want excellence go see them! My baby loves all the girls. I appreciate the staff. They are always friendly and they greet everyone with a smile. Most importantly, my dog Sophie can be difficult but the vet/technician some how manages to put her at ease. Kudos to everyone and I highly recommend this clinic. Dr Illel answered all my questions as it was my first visit with my puppy Kirby Most importantly the tech and Dr spent time with me and never made me feel they were in a rush to get out of the room!!!!! Everyone was so friendly and helpful and that made me feel good coming. I also appreciate the thought that went into what vaccinations were appropriate. A really good experience! Teddy and Lily saw Dr. Quisenberry and we were very pleased. We had never seen her before. We re always pleased with the staff and her assistant was very knowledgeable and took the time to talk to us about a few things that concerned me about Lily. Overall the visit was very efficient and completed in a timely manner. Thanks so much for your help. This was my first visit to this vet and every staff member was amazing and took great care of my little Bruce. I m new to the area and have been to a couple different vets up here leaving unsatisfied with the care and concern for my dogs. I’ve found my permanent vet in Village Square. Thank you for everything.